Representative stress-strain measurements, and the fracture morphologies for the original, ion irradiated, and irradiated and heated nanowires of MGs. The as-molded wires are seen to fracture in a brittle manner, while the irradiated wires demonstrate tensile ductility. Subsequently heating the nanowires brings back the brittleness. Metallic glasses (MGs) are an exciting class of materials due to a suite of attractive properties including high strength, large stretchability, high wear and corrosion resistance, and excellent magnetic properties. However, adoption of MG in many applications has been hindered by the fact that they are brittle: they can break apart very suddenly, especially when put under tension. Ductility – the ability to softly stretch without breaking – would be a better property to have. A possible way to make MG more ductile is to use extremely small specimen sizes. Typically, such sub-micron specimens are produced using the focused ion beam (FIB) method. However, in this process, unwanted ions can be implanted into the material, and this may affect its behavior. 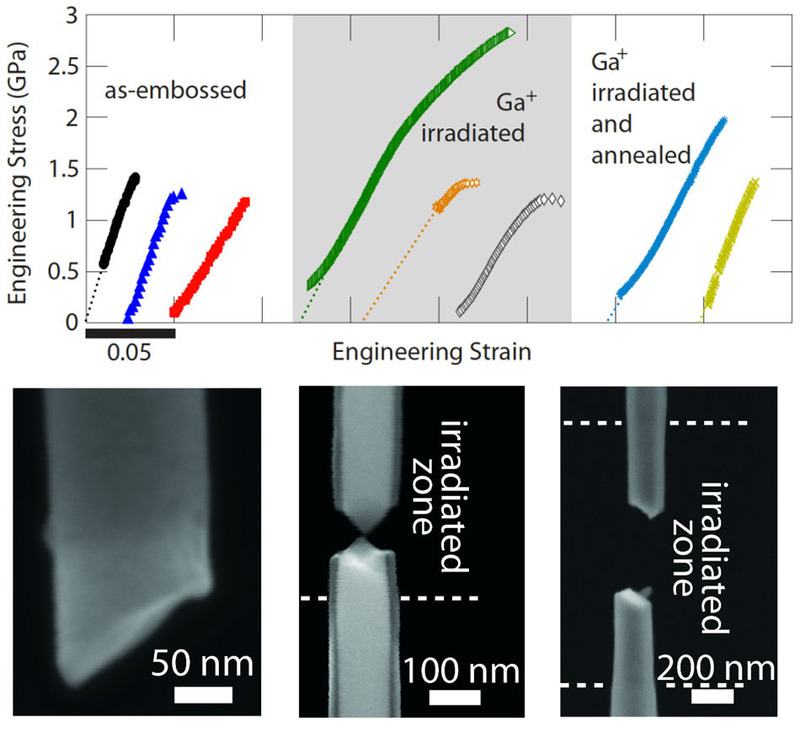 We employed a novel nano-molding process to produce pristine MG nanowires without using FIB. Thus, their properties are unaffected by ion irradiation. We then performed tensile testing inside of a scanning electron microscope to investigate whether subsequent exposure to ions has an effect on the mechanical properties. The nanowires fail due in a brittle manner when pulled in tension, as expected. After irradiation in the FIB, a different glassy structure produced in the MGs, and the MG is significantly less brittle. Surprisingly, this behavior can be reversed by then mildly heating the MG, thereby returning the glass to its as-molded state. This shows that we can tune the ductility of MGs.